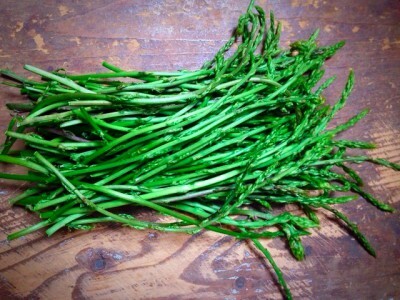 I am proud to say, I think Alain is the best wild Asparagus hunter in the village. We collected this huge pile on our Sunday promenade. Although abundant, it is truly like finding a needle in a haystack! After several years, I am finally getting the "eye" for it. I think yesterday I probably found 1/4 of the bounty. Wild asparagus omelette, tart, soup, steamed and served with a light vinaigrette.....lots of options and another bonus of April!